The slaty-headed parakeet is a medium-sized parrot found in the Himalayan regions of Pakistan, India, and Nepal. They thrive in high altitudes and have good natural resilience to cold weather. 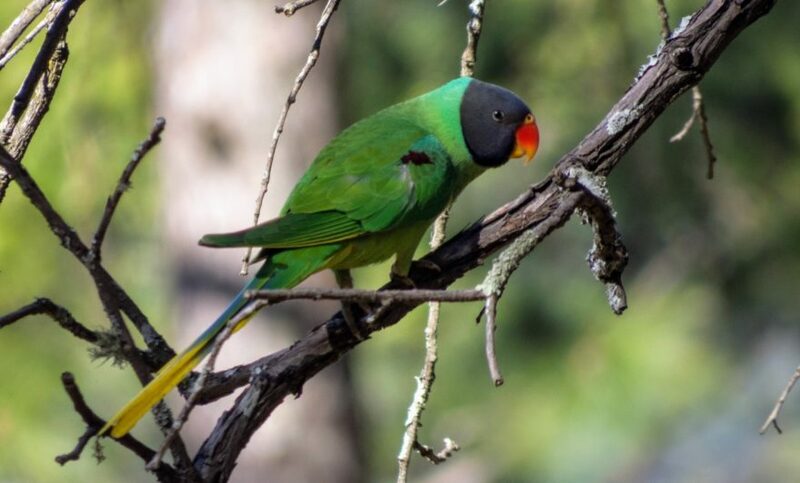 The species is closely related to the smaller plum-headed parakeet, although it is far less common in captivity. Nevertheless, they are well established and affordable in aviculture in Australia and throughout the world. Slaty-headed parakeets are somewhat placid birds that can share an aviary with other placid parrots outside of the breeding season. The female may become aggressive during the breeding season (which occurs in the spring), at which point single-pair aviaries will be necessary. Slaty-headed parakeets should be provided with an adequate amount of flying space to ensure they receive sufficient exercise. Birds that do not have room to fly may suffer from stress or obesity. They require a minimum of three meters of uninterrupted flying space. Branches from non-toxic trees should be provided as natural perches. The birds will also enjoy chewing on bark, leaves and seeds for entertainment and beak exercise. Slaty-headed parakeets are closely related to plum-headed parakeets, blossom-headed parakeets, and Indian ringneck parrots. To avoid producing hybrid birds that damage the limited captive gene pool of each distinct species, these species should not be housed together. Seed forms the basis of the slaty-headed parakeet’s diet. A quality mix designed for small parrots or Lovebirds will be acceptable. Slaty-headed parakeets also require a wide variety of fruit and vegetables to ensure good health. They prefer sweet juicy fruits such as apple and pear, but it’s important to also provide more-nutritious green foods such as broccoli, kale and bok choi. Corn on the cob is especially loved, as are peppers (chillis) and berries. Slaty-headed parakeets like to hold their food in one foot while perching with the other. Cutting fruits and vegetables into cubes of roughly one square inch will allow them to practice this natural behavior. Slaty-headed parakeets can be challenging to breed. Even under ideal conditions, they will generally only produce one clutch of 3-5 eggs per year. Breeding usually commences in spring as the weather begins to warm up. The male will court and feed the hen, who will begin inspecting available nesting boxes. Several different nesting boxes should be provided for them to chose from, as they can be fussy about the design and location of the box. Unused boxes should be removed. Incubation is performed exclusively by the hen and lasts for roughly three weeks. Young birds will fledge at 6-7 weeks of age and become fully independent from their parents a month later. Young birds can usually be housed with their parents, but they must be separated immediately if aggressive behavior is observed. Slaty-headed parakeets will accept a wide range of different nesting boxes or logs. A commercial nesting box designed for medium-sized parrots – either rectangular or Z-shaped – is ideal. An inch-thick layer of shaved pine or sawdust should be placed in the bottom of the nest. The male’s head is much darker than the female’s. Juvenile birds of different sexes remain identical for twelve months or more until the males begin to develop their adult head feathers. DNA sexing is the only way to accurately determine gender before this point. Female and juvenile slaty-headed parakeet may be indistinguishable from juvenile or female plum-headed parakeets. Always buy from a reputable breeder/dealer, or insist on seeing the parent birds before completing the purchase. Slaty-headed parakeets are not frequently kept as companion birds, but they can become excellent pets. They are competent talkers and have a reputation for being friendly and confiding. Like most Asiatic parrots, slaty-headed parakeets often go through a period of “bluffing” during the early years of their life. Bluffing is somewhat similar to human puberty in that it causes erratic, sometimes aggressive behaviour due to hormonal changes. With patience and commitment, this developmental stage will inevitably pass. A properly cared for slaty-headed parakeet will live for 15-25 years.